As this sweltering, energy-draining, lawn-killing stretch of Summer 2016 continues, here's an old Victorian trade card1 that seems relevant. 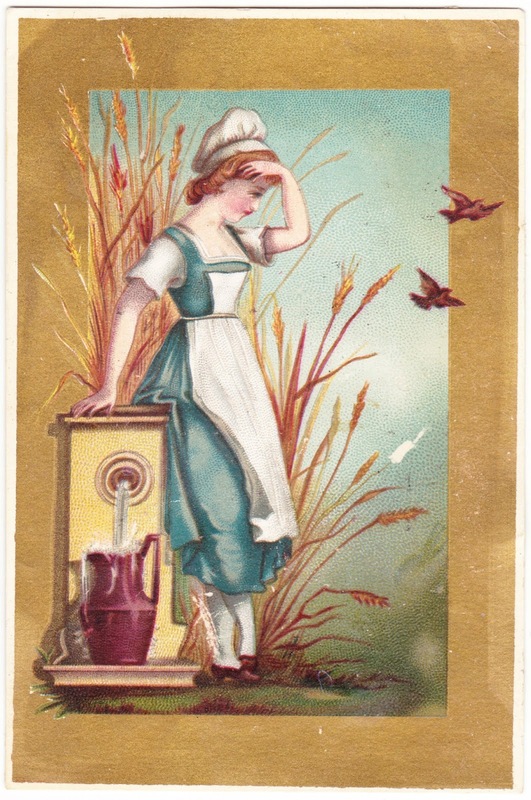 It features a young woman who is filling a large pitcher with water while looking very hot and fatigued. The card, which was damaged by being pasted into a scrapbook at some point, serves as an advertisement for the American Tea Co., which was located at "N.W. Cor. 11th & Spring Garden St." in Philadelphia, Pennsylvania. A man named Locker served as the manager. I found a few 1860s references to the American Tea Company — including an advertisement in The Evening Telegraph — but nothing that offered much information about its history. But a tall glass of cold iced tea certainly sounds like it would hit the spot right now, doesn't it? 1. The card measures 3⅛ inches by 4¾ inches.